Double Dragon Neon lands a first-frame hurricane kick to the junk with a virtuoso big-hair anthem that recaptures the lost spirit of the original ‘80’s arcade classic while reveling in the decade’s ridiculous excesses. As if powered by compositions spawned by some ancient Chinese magic, Jake Kaufman runs to the right and punches dudes in the face with the confident bravado of an action movie hero. The album greets us with the speed metal meets chiptune power ballad ‘Title Theme’, a song of equal parts ‘80’s arcade game and ‘80’s action flick. It could have been the theme song for Double Dragon or Beverly Hills Cop or Commando. Then we hear ‘City Streets 2 (Mango Tango – Neon Jungle)’ and everything clicks into place. Every beat ‘em up of the era wanted to be glam rock opera Streets of Fire (Streets of Rage anyone?) and now that the tech has caught up, Double Dragon Neon completes the transformation it began so many years before. There was always the retro sci-fi aesthetic and the kidnapped girlfriend and the biker gang holding the city in the grip of fear, now there’s the screeching wails and makeup. And as Billy and Jimmy step up to fight, the city rallies behind them. Just listen to ‘Level Select’. It’s music reinforcing story reinforcing gameplay. The music empowers the Lee’s. ‘The Tapesmith’ introduces the grimy fantasy rock and paints a picture of the man it’s named after. Listening to it you see the Tapesmith standing over his forge like it’s an extension of himself. It makes us believe he is striking steel that will be plunged into the heart of some Tolkien-esque dark lord. It’s the sensitive man’s plea, a complete reversal to the exuberant machismo and propulsive energy of the earlier songs. When I hear it, I can only picture Billy’s tear streaked face singing under a spotlight, eyes cast to heaven like he was Dill from The Crying Game. It’s great. And it reveals one of Kaufman’s greatest feats- every song is as authentic but completely self-aware. Listen to ‘One Inch Punch’ an exuberant Beastie Boys-inspired ode (let’s face it, probably to Stephen Seagal). The only thing missing is the head spinning break dancer and his over-sized chrome boombox. You could just jeep going- there’s the Enya-like dreamscape of ‘Balance’ and the throaty ‘Desperation’, which has all the listlessness of a Depeche Mode song- but revealing them all would ruin the joy of exploration. 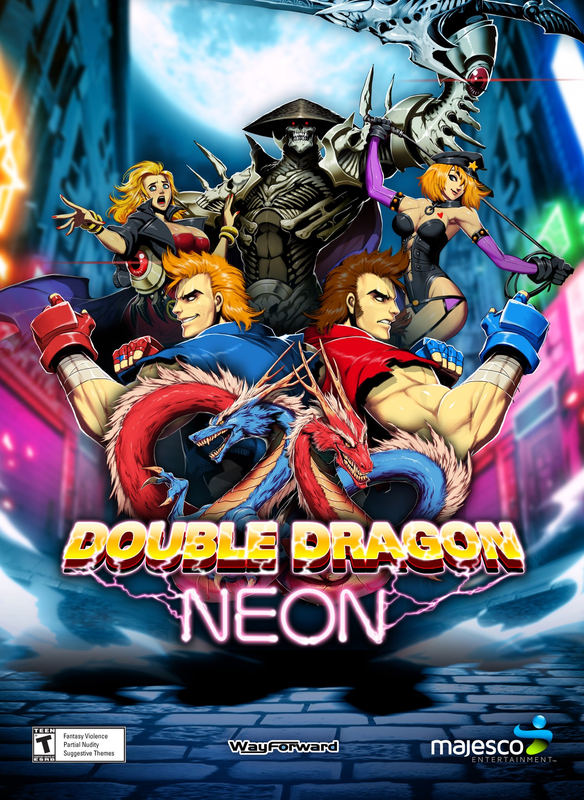 Double Dragon Neon is a hadouken to the face worth enduring.